Today, we are finally going to make actual Hiragana and Katakana lessons, i.e. we’ll be telling you what you need to know about them and what’s the best way of going about learning them. Second, you don’t need to know the Kanji origins to learn the Kana. It’s something cool to be aware of, but for practical purposes it’s trivia. It starts becoming important if you’re interested in old texts and Man’yougana and things like that. Third, don’t be fooled into believing that Hiragana is used exclusively for one thing and that Katakana is used exclusively for another. People are often told that Katakana is used for just loanwords and scientific terms, but that’s really not true. You’ll find things often enough in Hiragana and at some other point in Katakana that it’s best to stay away from any premature notions like that. Fourth, learning Kana is a weekend project. It’s not something that takes months and months to learn or anything like that. So, once you have a free weekend, you can get this under your belt, which is extremely helpful. Fifth, if you need a good online flashcard/game, realkana is very good and is a no nonsense platform. There are people who spend a big amount of their time creating mnemonic devices for Hiragana, probably more so than Katakana. Our advice is that you give it a shot without the mnemonic devices and see how it goes. We also encourage you to start with Hiragana because it is a fair bit more common. We assume that by the time you start looking at Kana flashcards, you are not trying to do them all at once. Instead, you should be starting with a group of 5 (preferably the vowels あ, い, う, え, and お) and adding another 5 once you have the main set mastered. In other words, you will have 5, 10, 15, 20, 25… all the way to 45. Once you have the 45 mastered and you’re comfortable with them, you can start worrying about the 25 that are just Kana you already you know with diacritics. You’ll see a pattern: /k/ turns into /g/; /s/ turns into /z/, /t/ turns into /d/. That’s simple. Then you just have to keep in mind that the /h/ series plus the ゛(dakuten) is /b/ and plus the ゜(handakuten) is /p/. Here’s the tricky part: じ is pronounced with an English /j/ sound; and ず and づ sound very much alike. 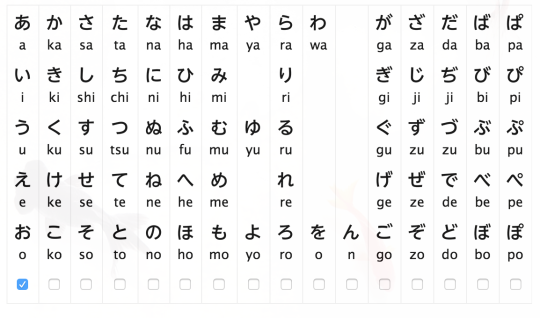 We here romanize づ as “dzu” and ず as “zu” just to make the distinction; and it may help you while you work on flashcards, too, to have them distinguished. 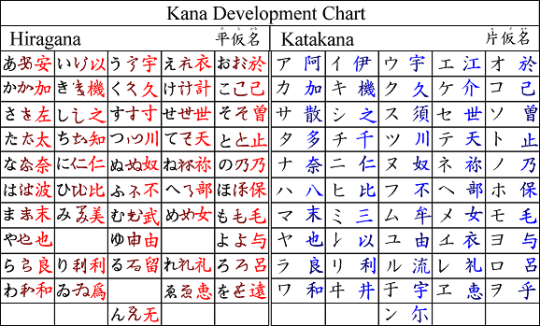 With your second set, you’ll realize that some Kana look similar: か and カ, へ and ヘ, and や and ヤ. These are like freebies. For Katakana, though, you have 4 very pesky characters you’ll have to look at a few times: シ, ツ, ン, ソ. They’re not the hardest things in the world, but it’d be wise to study these separately. The difference between シ and ン (one set) and ツ and ソ (another set) is that the first set’s lines are written left to right and the second set’s lines are written from top to bottom. You’ll also want to keep an eye on ヲ, which is a character you don’t get to see much of normally, and you way start to forget it. Okay, so how long does this really take? It depends on one’s ability to memorize things, obviously. But each should take one about 3 hours, thereabouts. 90 characters is not a lot by any stretch of the imagination. Your mind is memorizing much more elaborate and complex things every day, so don’t sweat this.